Dubbed by R. J. Reilly as "The Silver Fox"1, Bob began playing platform tennis in 1963 and has devoted his life to being a teaching professional for the past 35 years. He is a National Senior Champion, finalist in four National Championships, a founding member of both the former American Professional Platform Tennis Association and a former officer of the USA Professional Platform Tennis Association. He served on the APTA Board as Chair of the Equipment & Rules and Umpire Committees. Bob has taught both male and female players who have won over 60 National Platform Tennis Championships. 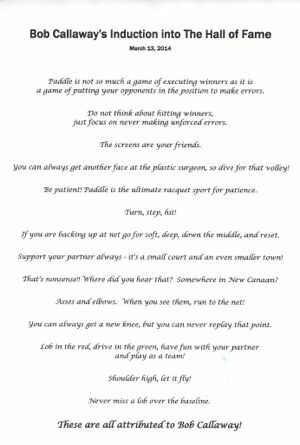 Bob started the first commercial platform tennis facility in 1972 in Norwalk, CT (“The Paddle Tennis Center”) which had over 400 players weekly in clinic programs. The Center was the first of its kind and became a place where top players could come and play. Bob was USPTA tennis pro at New Canaan Field Club, ran the platform tennis and squash program at New Canaan Country Club, and taught both platform tennis and tennis at The Field Club of Greenwich. Bob was the Head Paddle Pro at Wee Burn Country Club in Darien from 1998-2012 until he retired. Bob conducted clinics for the Viking Kick Off Academy, the R. J. Reilly Paddle Academy in Jackson Hole, Wyoming and gave private lessons and clinics nation-wide. In addition to his time on the court, Bob authored the book, Platform Tennis published in 1975, and wrote numerous articles for Platform Tennis Magazine. Bob was active in running tournaments and was the Tournament Director for the 1984 APTA National Championships. He als was an announcer at a number of professional tennis tournaments. Note 1: Behind the Screens, Winter 1990, published by Richard J. Reilly, Inc.
We are here tonight to honor a very special person, a trail blazer who dedicated almost his entire career to platform tennis. No one has ever done as much, on such a full time scale, with such longevity as Bob Callaway. At his core, first and foremost, Bob was a teacher. It was not about him, it was about his students. He cared deeply about them and their progress. Could they learn the game? Were they having fun ? Could he organize a game for them? Could they make one of the teams? How could he keep them coming back? What could he do to grow the game? He was an unselfish man. He studied the game. If you read his paddle book and see the 6 frames of photo of John Mangan’s forehand, you understand how meticulous he was. He observed, he learned, he participated, he taught. This was his craft. Bob was arguably “the first paddle pro”. He began in the late 1960’s and retired in 2012 at age 78. Today, there are well over 200 paddle pros nationwide. You paved the way Bob…..these pros today are flourishing and providing vital leadership, energy, and growth. He was a top 16 player on the 1970’s tour and later became a National Senior Champion. His was known for his “signature lefty kick-spin serve” (a truly nasty shot). But tournament play was not where Bob was destined for greatness. It would be in a far broader realm. Bob was also an entrepreneur and risk taker who opened the first commercial Paddle Center in Norwalk, CT in 1972. For ten years this was a gathering place for men, women and children from all over Fairfield and Westchester1. Bob literally introduced the game to thousands of people at this first public paddle center. As Bob’s career progressed in the 80’s, 90’s and 2000’s, he served with great distinction as the Head Paddle Pro at the New Canaan Field Club, Wee Burn Country Club and taught a number of other local clubs including the Greenwich Field Club. He also began to consult in the executive presentation skills field and made regular trips to teach his corporate clients in NYC and Connecticut. This made for very long days……as in when you wrapped up a seminar with business executives, you then had to dash off to a 7pm clinic or playing lesson, probably changing your clothes in the car or the bathroom on the train. Bob was also an author, writing a book titled “Platform Tennis”. It was an overview of the game, it’s history, with insights into each stroke. It served as a very sophisticated teaching guide and 225 pages no less. – He was a founding member of the PPTA and an APTA Board member. He played a vital role in stewarding APTA Rules and recruiting and training Umpires. He conducted certifications programs over many years. He was always generous with his time whether it be traveling to the R.J. Reilly Paddle camps at Jackson Hole or helping lead the Viking Junior Kick-Off Academy. Bob’s enthusiasm for the game was contagious and this positive attitude made learning fun. In many ways he became an ambassador for the sport. He coached many National Champions at various stages of their careers (collectively these individuals won over 60 National Championships). Many of these players are in the audience tonight. They’re here to honor Bob, for all his support, his guidance and his friendship. As one of his protege’s said, “Bob worked a lifetime to grow platform tennis – he did this by connecting and inspiring others. Bob’s legacy will always be about the people who he helped to get involved in the game”. 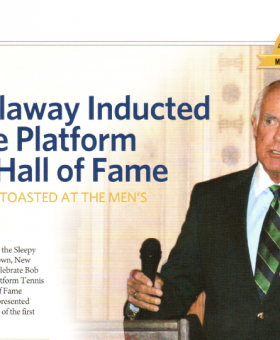 And now, he is the recipient of the APTA’s highest honor, the Platform Tennis Hall of Fame award to BOB CALLAWAY. Callaway grew up in Westfield, New Jersey and did not play tennis until he was 12 years old as tennis was considered a sissy sport and in Westfield you played football, basketball and baseball or you were an outcast. A number of his friends got interested in tennis because they were bored during the summers and could get a real good deal for juniors at the Westfield Tennis Club. However, he returned to the three main sports through high school and college (Washington & Lee), but regained his interest in tennis after college while in the Navy. When he started his career in the advertising business in New York City he began playing tennis frequently with some good players which led to an invitation to play paddle by Bill Pardoe (Hall of Fame 1969), whom he had met at a tennis tournament in Bermuda. Bill subsequently had to cancel their date to play at Fox Meadow, but Herman Schaefer, who lived in New Canaan, had just had a court built on his property and so Callaway finally got my opportunity to play. Most of his early introduction and instruction in the game came from Mason Delafield’s father who took Mason, Duke Felt and him out on a private court in Darien on the weekends. He played his first tournament, the Rye Invitation, in 1963 with Duke Felt. Callaway started giving a few lessons in both tennis and paddle around 1968. Callaway was selected as the first PPTA representative on the APTA Board and served on the APTA Board from 2005-2007 where he chaired the Rules and Equipment and Umpires Committees2. After his time on the Board he continued to head up the Equipment & Rules Committee for a few years before turning over the reins to Martin Sturgess several years before he retired.